The first Clemson-class destroyer was also the first destroyer delivered by Bethlehem at its new purpose-built facility at Squantum, Massachusetts—USS Delphy, Destroyer No. 261. Laid down on 20 April 1918, this first ship of the “Delphy class,” as referred to in some sources, was sponsored at her christening on 18 July by Mrs. William S. Sims, wife of Rear Admiral Sims. She was placed in commission on 30 November 1918 under the command of Commander R. A. Dawes. From 23 to 31 December 1918, Delphy tested submarine detection devices at New London and on New Year’s Day 1919, steamed to aid survivors from the troop ship USS Northern Pacific, which had run hard aground off Fire Island, New York. On 13 January, Delphy sailed from New York for winter maneuvers and torpedo practice with the Atlantic Fleet in the Caribbean. Returning to New York on 14 April, she sailed for Boston on the 30th to prepare for the first transatlantic seaplane flight. On 19 November 1919, Delphy sailed from Boston for the West Coast and arrived at San Diego on 22 December. There she joined Destroyer Squadrons, Pacific Fleet, for torpedo practice and recovery until placed in reserve 12 June 1920. Delphy lay at San Diego until 27 December, when she sailed with the other ships of Reserve Destroyer Division for an extended overhaul at Puget Sound Navy Yard, arriving 4 January 1921 . Between 22 July 1921 and 20 March 1922, Delphy operated from San Diego with 50 percent of her complement, then was overhauled. As Flagship of Destroyer Squadron 11, she departed with the Battle Fleet on 6 February 1923 for exercises off Balboa, Canal Zone, and then returned to San Diego for to carry out experiments with torpedoes. On 25 June, Delphy and her squadron got underway for a cruise to Washington for summer maneuvers with the Battle Fleet. 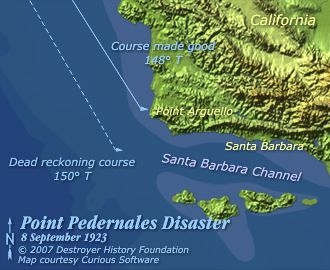 On the morning of 8 September during the return passage, Delphy led her column of 14 destroyers into a fog bank off California’s Point Pedernales. Within minutes, she stranded at speed on a rocky outcropping locally known as “Honda,” north of Point Arguello at today’s Vandenberg Air Force Base. S. P. Lee, Young, Woodbury, Nicholas, Fuller and Chauncey followed in quick succession; three other ships touched bottom before backing clear. Pinned broadside against the cliff face, Delphy eventually broke in half with her stern below the surface. She lost three dead and 15 injured. She was decommissioned on 26 October and sold as a wreck on 19 October 1925. Today, her damaged starboard screw may be seen outside the Veterans Memorial Building in the nearby City of Lompoc.